It’s amazing how quickly you can get used to something. 3.54 a.m., freezing rain hammers relentlessly against the metal roof, and I’m desperately fighting sleep in the back of a dark ambulance as it tears across town to an unspecified incident – the only information passed so far: police on scene, significant blood loss. Doesn’t really matter though – whatever it is, we’ll deal with it. No matter how much rest you’ve forced upon your confused body in preparation for a nightshift, the hours between 3.00 a.m. and 5.00 a.m. are always the hardest - when the majority of the sleeping populous refrain from falling down stairs, crashing their cars, or maiming themselves and each other – lulling you into a false sense of security. Speeding through the dark streets on blue lights seemed the most exhilarating thing in the world only a few months back, but now, even this early on in the training, the rocking of the unbalanced vehicle soothes me, the flashes of blue illuminating the rain outside the window are no more than a nightlight, and whatever unpleasant scenario we’ve found ourselves hurtling towards is just a problem that can wait – I’ve still got at least four whole minutes before I have to deal with it. That’s what the five seconds are for. Watch a Paramedic arrive at the scene of an accident – they’ll walk slowly and silently towards the casualty – assessing the situation, potential dangers, supressing their own horror and panic, deciding whether to ‘grab and go’ or ‘stay and play’. The ambulance skids to a stop. I’d only closed my eyes for a second. The oppressive fluorescent lighting flickers to life, stinging my eyes as I grab the heavy kit bag and oxygen cylinder from beneath my seat. In the few seconds it takes me to equip myself, my mentor has already jumped out, pulled the sliding door open with a bang, and made a facetious comment about me not caring that somebody’s dying, as usual, with a smirk on his face. Stumbling out into the cold air is like a shot of adrenaline. Instantly, I’m wide-awake again, assessing the scene – two police cars, three officers struggling with an intoxicated man in a blood-covered t-shirt. I notice my mentor having a private word with another police officer, learning of what’s in store for us. Nobody seems overly concerned, but I know he’s not going to tell me. He wants me to walk in there clueless, to use my five seconds wisely - to make my decisions and have a plan in place by the time I reach the patient. Behind me, our crewmate for the night follows me inside as an audience of nosey neighbours peer gormlessly through their windows as though they were television screens. I step up into the dirty hallway, bright red blood smeared across the yellowed walls. The smells of cigarettes, dog, and Fish Fingers are the strongest. The hum of voices emanates from the next room, where broken glass booby-traps the open doorway. ‘They’re here now. They’re here. Everything’s gonna be OK,’ I hear one of them assure the other. 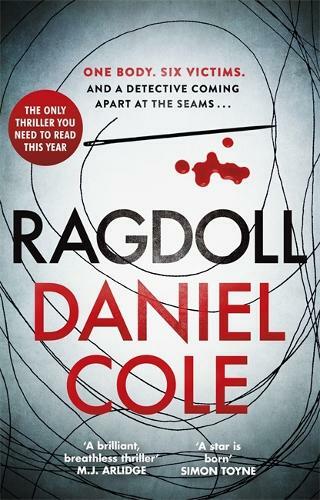 Join us at our Yeovil shop on Tuesday the 4th April for a relaxed evening of discussion and drinks with three debut crime writers: Daniel Cole, Fiona Cummins and Alice Feeney. A dark, crime thriller with twists and turns you won't see coming for fans of Robert Galbraith, Paula Hawkins and Jo Nesbo. The beginning of an exciting new series starring detectives Wolf and Baxter.